Hiking from one beautiful place to another on pleasant and well-maintained trails is a great way to spend five days. Doing so with a good friend and cooperative weather makes a great experience even better. Throw in a few synchronous strokes of good fortune and you end up with an incredibly rewarding and memorable adventure. 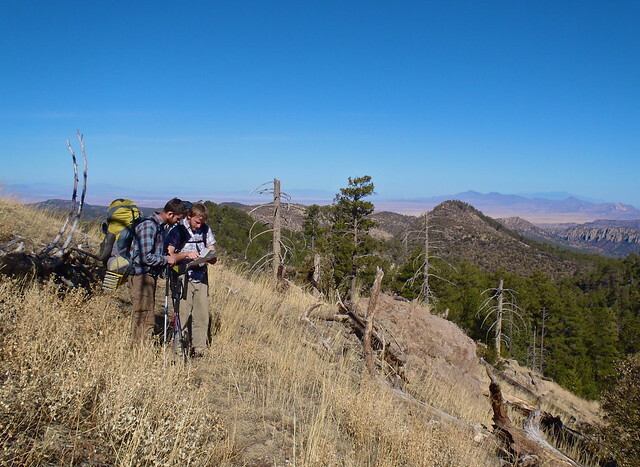 Neither John nor I had been on a four-night trip since March 2011 when he, myself and my girlfriend at the time did a trek through the Chiricahua Mountains in southeastern Arizona. John was working nearby in Sierra Vista, Arizona with the US Forest Service at the time (we had met while working with the USFS in Kentucky) and invited us out for a spring break trip. That trip was my first time backpacking out West and was simply incredible; I promised myself it wouldn’t be my last. Fast forward almost five years and a lot has changed in our lives, both personally and professionally. I moved from Kentucky to Montana and John lives in Florida and is recently married. This summer found him in Alaska working a seasonal job with the Forest Service and his itinerary on the way home to Florida included a stop in Hamilton with time set aside for a five-day backpacking trip. Over the summer, I contemplated various destinations for our trip. 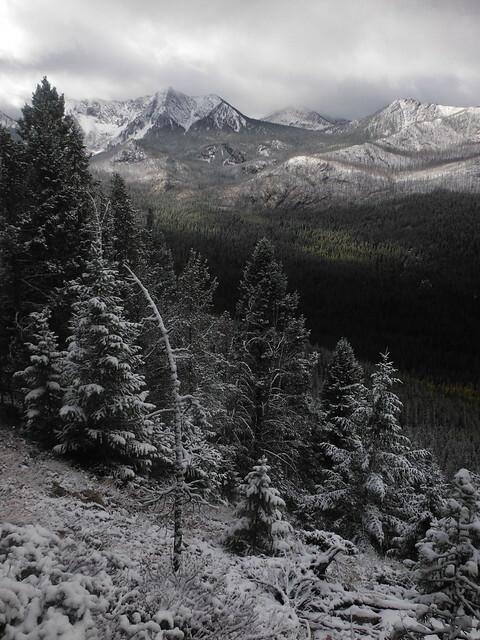 Glacier National Park, the Bob Marshall Wilderness, and the Gros Ventre Wilderness all received ample consideration. I pored over maps and diligently read and re-read guidebook descriptions and information I found online. I asked seasoned hikers for their suggestions. 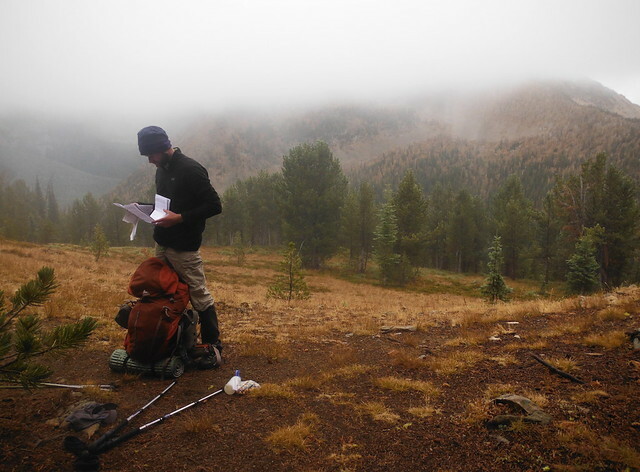 Eventually, I settled on a 40-mile loop in the Anaconda-Pintler Wilderness of western Montana for our trip. It ranked high in the scenery department and low in the crowds department, it didn’t require any permits or fees, and the trailhead was an enjoyable two-hour drive away. 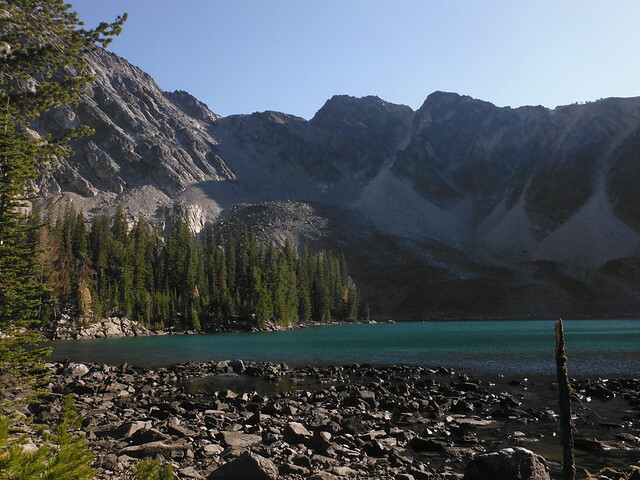 It offered nice options for camping at various lakes and meadows and included a section of hiking above treeline that virtually guaranteed majestic mountain views. 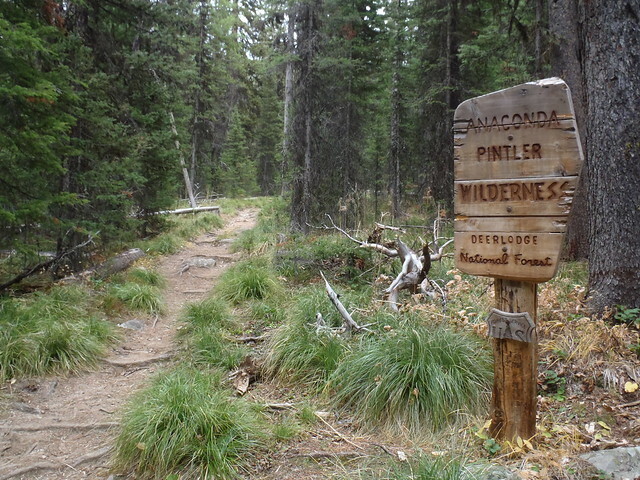 The fact that a guidebook described it as “perhaps the single best alternative for folks wanting to see the best the Anaconda-Pintler Wilderness has to offer without going to the trouble of setting up a long shuttle for the Continental Divide hike” also gave me considerable peace of mind in the decision. After the enjoyable but tedious pre-trip legwork of packing, meal selection, and checking in with the three different ranger districts through which we would pass in regard to trail conditions, we finally made the uneventful drive to the trailhead. 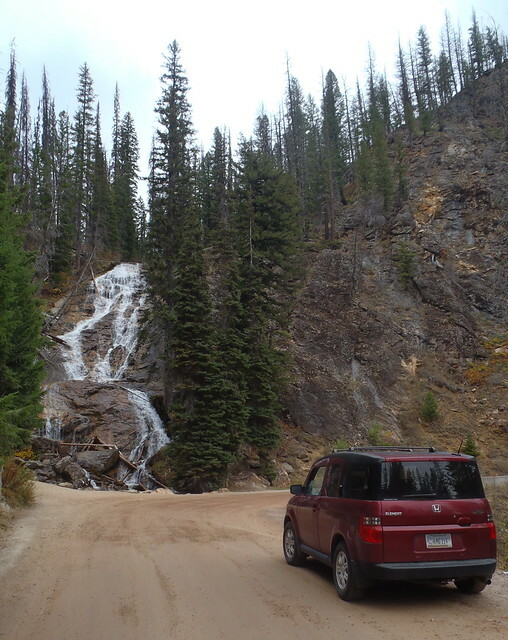 Half of the drive was on dirt roads and included a brief stop at Skalkaho Falls. We found ourselves parked by mid-afternoon at a large trailhead which we shared with a truck towing a horse trailer. 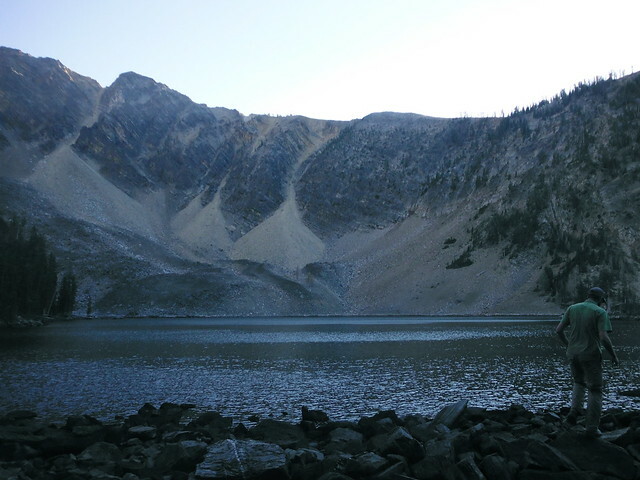 Once the requisite stretching and map reading were completed we began the 5-mile hike to Johnson Lake where we would spend the night. This was the shortest day of our trip, but it certainly didn’t lack in scenic rewards. 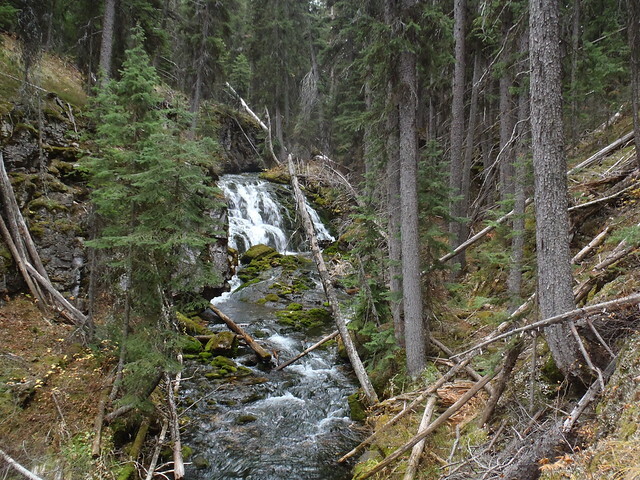 Two nice waterfalls broke up the comforting monotony of the coniferous forest through which we hiked. We made good time to Johnson Lake and arrived in good spirits despite the drizzly weather. 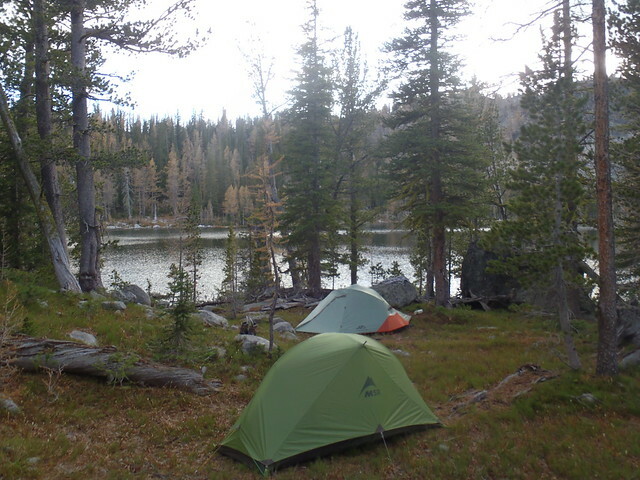 Once our tents were set up near and bear bag hung we headed for a lakeside dining spot and enjoyed pasta and tuna with fresh spinach and mushrooms. It would’ve been nicer if the tuna was fresh, but hey, this is backpacking. We called it an early night and found ourselves in our tents by 9 p.m. as a light rain tapped out its inimitable rhythm on our sil-nylon roofs. The morning shifted from darkness to overcast glow and eventually daylight with an unhurried pace. We found ourselves packed up and climbing the trail to Rainbow Pass at a respectable time and at a respectable pace. Mid-morning found us at Rainbow Pass (9,250 feet) and we took a short break to enjoy the views and review the plan for the rest of the day. It seemed to make more sense to push on to Rainbow Lake, a mere downhill mile away, for an extended break rather than stretch out our time at Rainbow Pass. The lake was a perfect place for a break but it didn’t hold any great appeal for camping. We enjoyed some coffee and conversation, each made more pleasant by the presence of the other, before starting the descent down the drainage to the junction with the trail to Warren Lake. As expected, we made great time on the descent and lagged slightly on the uphill section. 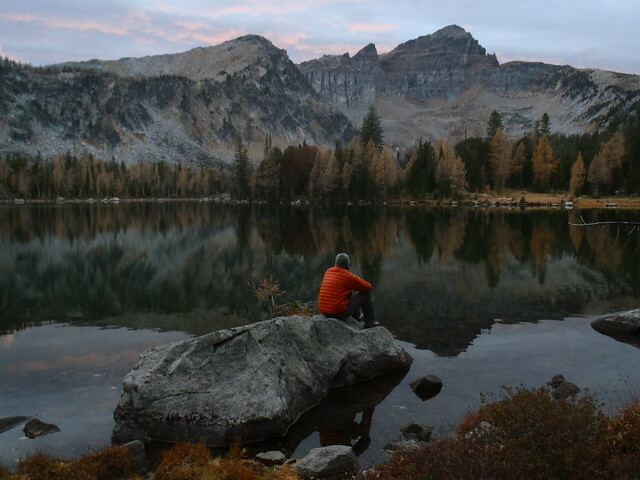 We reached Warren Lake with plenty of daylight left to allow us to search around for a good campsite and enjoy some leisure time before dinner and sunset. The daylight we had left was a light worth talking about — what a warm and sublime illumination it was as it shone upon the mountains, the water, the rocks, and the trees. Quintessential autumn light at a quintessential mountain lake. Warren Lake is an exceptionally scenic lake (there’s a reason it’s on the cover of the only guidebook to the area) and seeing it under such prime conditions was a visual pleasure that’s hard to explain or exaggerate. As twilight neared, it became apparent that the day’s sunset would be much more entertaining than its sunrise. Faint pinks and purples became more vivid and the blue shifted to a rich darkness that perfectly contrasted the other colors in the sky. This beautiful and fluid mosaic of clouds and sky reached a fever pitch of intensity, almost humming with depth and energy, reflecting off the lake, before becoming a dark, moody and mostly cloudy ceiling above our little corner of the Rockies. Stuffed from an oversized dinner of burritos and still awe-struck from the sunset, we digested and decompressed beside a small campfire. Although not a frequent part of my backpacking repertoire, the fact that the wood was conveniently stacked beside the fire ring and a desire to remain reasonably well-practiced in this art of woodcraft compelled me to go through the motions and put match to tinder. While not as mesmerizing as the sunset, the campfire proved — as always — to be a relaxing way to wind down the evening. A sunny and nearly cloud-free sky greeted us in the morning and we packed up at an efficient pace, despite a reluctance to leave. 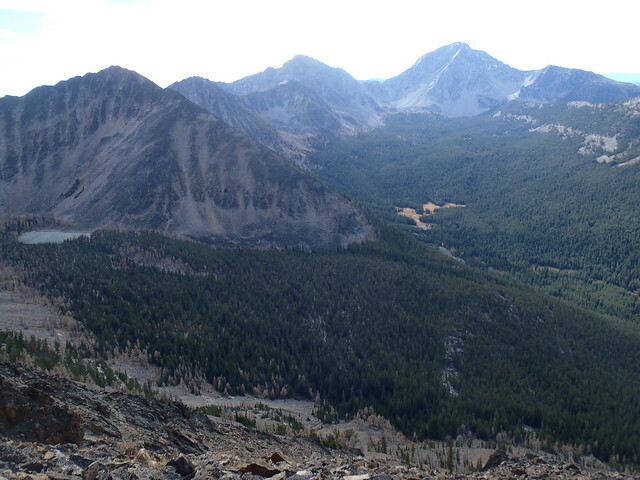 This day would be our longest hike of the trip (approximately 12 miles) and featured a significant descent, followed by a long climb to Cutaway Pass, a few miles of above treeline hiking, then a seemingly endless descent to Black Bear Meadows, where we would pitch camp. The section of trail descending from Warren Lake was a delightful way to start a gorgeous and unseasonably warm October day. Some sections of trail were indescribably lovely under the conditions in which we hiked them. 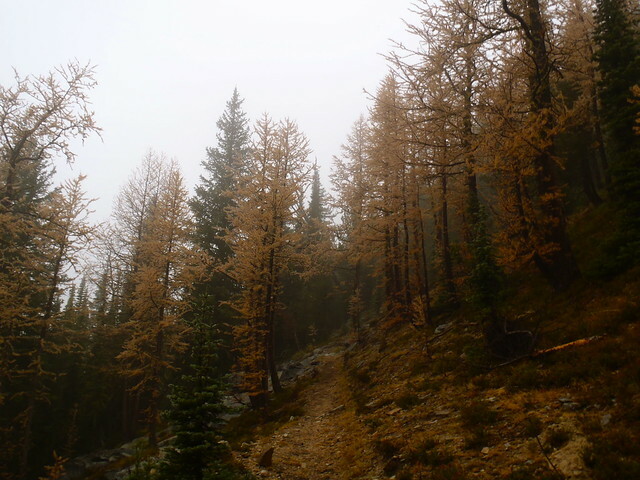 We navigated tight switchbacks carpeted with golden larch needles before reaching straight, gently graded, narrow sections of trail which passed beneath towering lodgepole pines. The climb up to Cutaway Pass was less visually charming, at least until we were high enough to catch glimpses of the mountains and get our first taste of the middle portion of the day’s journey. It wasn’t early and it wasn’t late when we reached Cutaway Pass and took a break to snack, soak up the view, and rest for the next section of hiking. 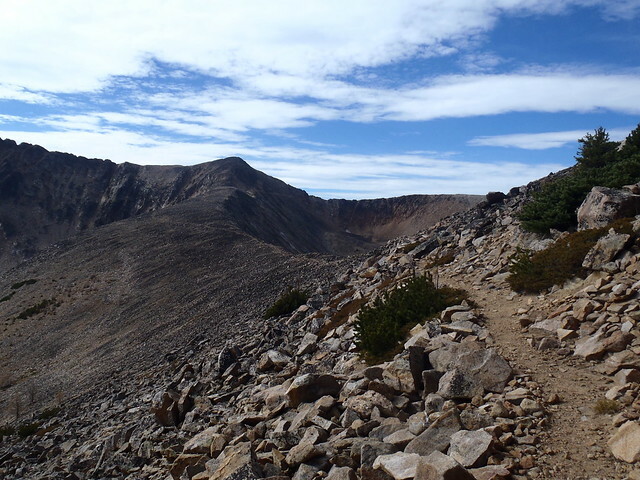 While I don’t have a breadth of experience when it comes to high-country hiking, I feel comfortable stating that the next section of trail (from Cutaway Pass to an unnamed pass) was indeed a fine example of northern Rocky Mountain alpine scenery. We enjoyed unobstructed views of various mountains ranges near and far, glimpses into glacial cirques (some with lakes and some without) and the thrill of being on a treeless ridgecrest. Perhaps the grandest vista was the one we took in right before we began our descent — a sweeping panorama which included an unnamed lake, Warren Peak, and most enticingly, a view down into the meadow where we would be camping that evening. To say the descent took forever would verge on being an understatement. The majority of our afternoon seemed to be spent on endless switchbacks, some long and some short, but it sure beat sitting in traffic or doing laundry. We didn’t have too much time to spare time once we finally reached Black Bear Meadows, which was just as idyllic up close as it looked from 9,700 feet. 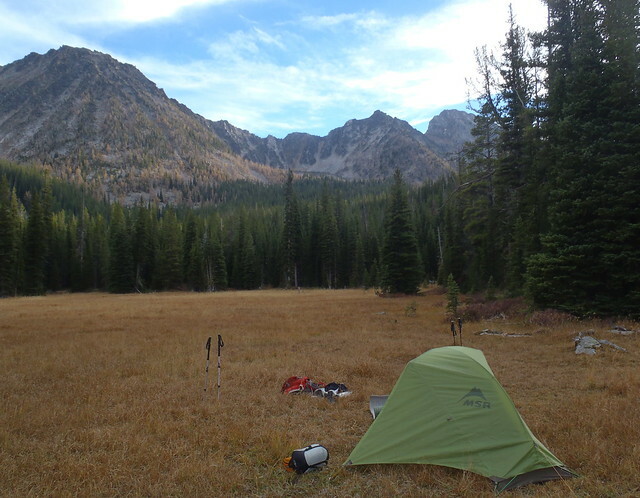 Black Bear Meadows was an easy place to camp in as virtually the entire acreage was flat and every spot to pitch a tent had a backdrop worthy of a magazine cover. We pitched our tents in what we thought was a fine spot, but it was subsequently upstaged upon our early evening “discovery” of the Bonus Meadow. Separated by a small creek shaded by trees, this adjacent meadow offered spectacular views and included a feature designed for comfort — a large perfectly shaped and slanted rock slab that could accommodate two humans in supreme comfort and provide them with a breathtaking view of Warren Peak and adjacent mountain slopes. Needless to say, we had dinner at this too-good-to-be-true spot after some Frisbee throwing in an attempt to stay loose and stretch our muscles before settling down. The stargazing from this spot was as incredible as the sunset had been the previous evening. The silhouette of the mountains with the stars above made for a truly remarkable view. A shooting star streaked across the sky a mere split-second after I commented to John that we would be seeing some shooting-star action once the skies darkened enough. Coincidence or synchronicity? I’ll opt for the latter. With stars above and perfect seats we stayed up considerably later than on the other nights of the trip. We sipped just enough bourbon to enjoy a warm fuzzy feeling of accomplishment and camaraderie without having to pay a penalty the next morning. We awoke not long after sunrise to a beautiful morning and warm temperatures. As was the routine, we enjoyed a quick but not rushed breakfast while packing up our gear. We had a relatively easy day of hiking ahead of us, especially when compared with the previous day’s effort, and started up the trail with a spring in our steps. We reached Warren Pass in 90 minutes, a modest accomplishment for two non-competitive hikers such as ourselves. On the way to the pass, we strolled through several spectacular meadows as well as a stunning tarn tucked into the woods. Descending from Warren Pass, we passed Upper Carpp Lake before following the trail as it wound between Carpp Lake and Lower Carpp Lake. 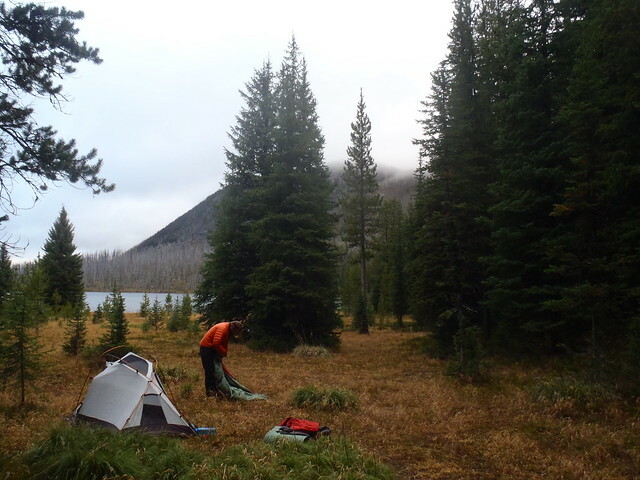 A few tents were scattered along the lakeshore and we encountered the first other hiker we had seen on the trip. 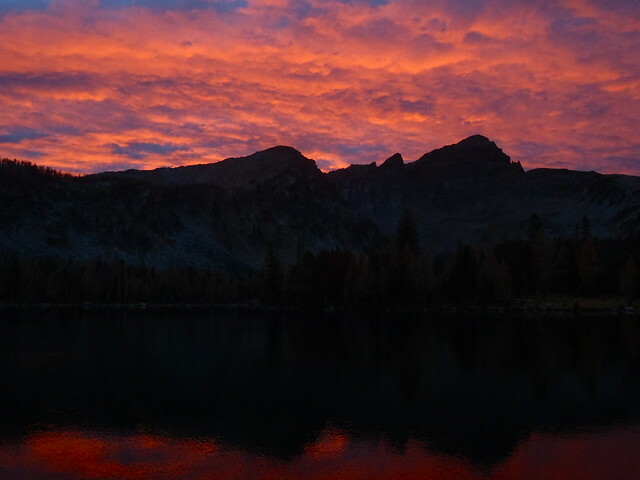 We had decided the night before that our campsite for the final night of our trip would be at Tamarack Lake, requiring a three-mile roundtrip hike from the main trail we had been following to this absolute gem of a high mountain lake. Although we made good time to the lake, I found myself more tired from the effort than I expected and set my tent up at the first spot that looked decent. It wasn’t a bad spot by any means, but while walking around the lake later in the day I stumbled upon a much more appealing spot, which I will definitely put to use in the future. Half-hours on Earth, what are they worth? And they just wash against me, like the sea into a pier. I don’t know either, but I do know for certain that all too few of my half-hours on Earth have been spent in places as beautiful as Tamarack Lake. Our dining spot for the evening provided a great view of the lake and was well-protected from the wind, which had picked up over the course of the day. We headed into our tents not long after darkness settled and endured a night of sustained and at times strong winds (some gusts likely exceeding 35 m.p.h.) that also brought with it a few inches of snow. Fortunately, ear plugs allowed me to sleep relatively uninterrupted; lacking such equipment John’s night was a bit less restful. The morning was slightly overcast, with wind and snowfall sticking around well into the morning. I awoke before John and headed over to his tent after retrieving our food bags and provided a friendly morning wake-up call, letting him know that I would have coffee ready by the time he go out of his tent. 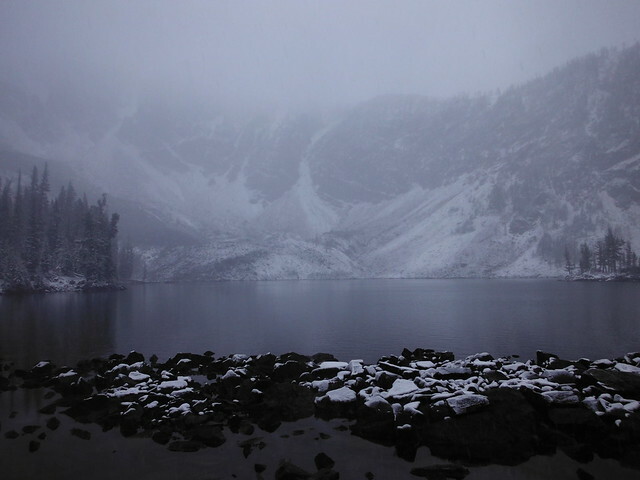 A few minutes later, sipping coffee on the lee side of lakeside tree trunks and watching the warm mist from the cups twist in the wind and mix imperceptibly with the snowfall, it was hard not to smile even given the rough conditions. It was like we had awoke in a completely different season; we got a “two-for-one” deal on conditions at the lake — fall and winter separated by only a few hours. Perfectly equipped to handle this change in weather, we packed up and hit the trail without incident and with less than nine miles left on our journey. The first few miles of our hike out were so intensely beautiful that it is hard to describe them. The cliche about “hiking in a a snowglobe” seems appropriate enough. The carpet of snow on the ground and the snow falling from above, combined with the intrinsic enchantment of a dense coniferous forest made even more spectacular by the dusting of snow that clung to its trees, was illuminated by a sky full of faded pastels — creams, yellows, pinks, hints of blues. As the day went on it shifted from a backlit overcast to partly cloudy, with healthy amounts of blue sky making frequent appearances. We both agreed that if we could’ve chosen snow or no snow for the hike out, we definitely would’ve chosen snow. 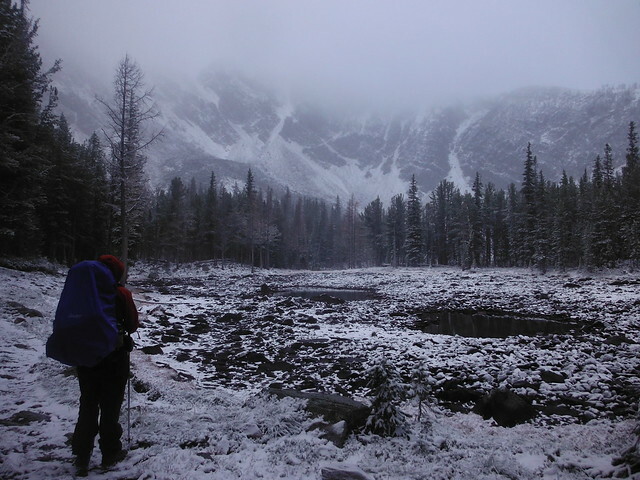 As we hiked we eventually fell below the snowline and knew we were entering the twilight of our journey when we heard the upper of the two waterfalls we had passed on our way in five days before. We arrived back at the trailhead around 1 p.m., tired but exhilarated and rejuvenated by the experience. As can be inferred from my lengthy description our trip, this 43-mile loop with over 9,000 feet of elevation gain (including the spur to Tamarack Lake) and a maximum elevation of 9,700 feet is an epic hike, although it takes a bit of time to reveal its most superb characteristics. It’s certainly not an “instant gratification” type of trek, with the best scenery reserved for the second half of the trip. 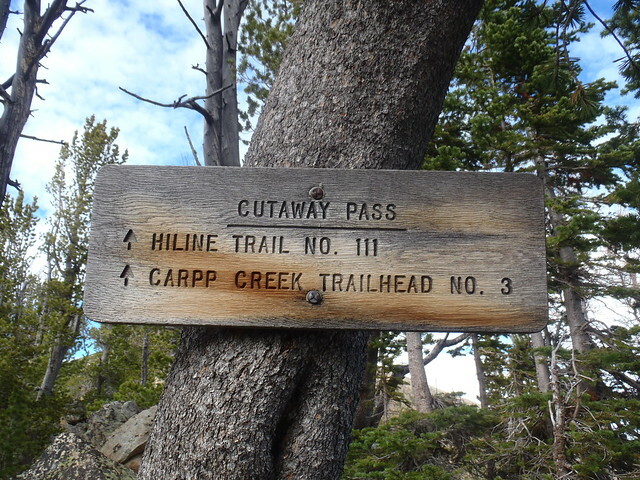 While the trails were in great shape during our hike and junctions were clearly marked, the terrain traversed and the distances separating the most desirable campsites make this hike, at least the way we did it, one which edges into the “difficult” category. Experienced backpackers in decent shape should have no trouble with it, but it could pose a challenge for the out-of-shape or underprepared.